Not to be confused with Bagdad Airport. Baghdad International Airport (IATA: BGW, ICAO: ORBI), previously Saddam International Airport (IATA: SDA, ICAO: ORBS) (Arabic: مطار بغداد الدولي‎), is Iraq's largest international airport, located in a suburb about 16 km (9.9 mi) west of downtown Baghdad in the Baghdad Governorate. It is the home base for Iraq's national airline, Iraqi Airways. The present airport was developed under a consortium led by French company, Spie Batignolles, under an agreement made in 1979. The Iran/Iraq war delayed full opening of the airport until 1982. The airport at the time was opened as Saddam International Airport, bearing the name of the former Iraqi president, Saddam Hussein. 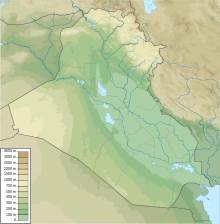 Most of Baghdad's civil flights stopped in 1991, when the United Nations imposed restrictions on Iraq after the Iraqi invasion of Kuwait during the Persian Gulf War. Because of the no-fly zone imposed on Iraq by the United States and the United Kingdom, Iraqi Airways was only able to continue domestic flights for limited periods. Internationally, Baghdad was able to receive occasional charter flights carrying medicine, aid workers, and government officials. Royal Jordanian Airlines operated regular flights from Amman to Baghdad. 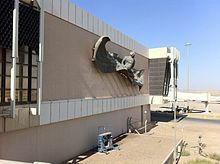 In April 2003, US-led coalition forces invaded Iraq and changed the airport's name from Saddam International Airport to Baghdad International Airport. The ICAO code for the airport consequently changed from ORBS to ORBI; the IATA code subsequently switched from SDA to BGW, which previously referred to all Baghdad airports and before that to Al Muthana Airport when Saddam was in power. Civilian control of the airport was returned to the Iraqi Government in 2004. Sather Air Base came under fire from periodic rocket attacks from Baghdad. On Dec 6, 2006 a 107 rocket attack landed 30 yards (meters) from a parked C-5A aircraft placing scores of shrapnel holes in the aircraft. Terminal C has been refreshed with three active gate areas for carriers operating from the airport. In January 2015 a FlyDubai jet carrying 154 passengers was struck by gunfire as it landed at the airport. One passenger was injured when at least three bullets struck the plane. After the incident, UAE carriers FlyDubai and Emirates suspended their flights from Dubai to Baghdad. Flights by Turkish Airlines and Royal Jordanian were also temporarily suspended. Baghdad Airport Road, connecting to UAE Green Zone, which was once a dangerous route full of IEDs, has been refurbished with palm trees, manicured lawns, and a fountain, with Turkish assistance. Within the airport there is a separate enclave called the New Al Muthana Air Base where No. 23 Squadron IqAF is based with three Lockheed C-130E Hercules transport aircraft and the home to a number of Sukhoi Su-25's. Sather Air Base or Camp Sather was a United States Air Force base on the west side of the airport occupied from 2003 to 2011 during the Iraq War. It was named in memory of Combat Controller Staff Sergeant Scott Sather, the first enlisted Airman to die in Operation Iraqi Freedom. Sather was awarded the Bronze Star Medal with Valor for his leadership of a 24th Special Tactics Squadron reconnaissance task force during the initial stages of the 2003 invasion of Iraq. The airport officially reverted to civilian control on 25 August 2004. Iraqi Airways resumed regular flights, and courier carriers also began flights. On October 2008, Turkish Airlines launched nonstop service to Baghdad from Istanbul Atatürk International Airport with three weekly flights. On 9 October 2009, Middle East Airlines announced flights to Beirut from Baghdad. Flights operated 4x weekly from 29 October and soon after upgraded to daily service. They'd use Airbus A320 aircraft for the flights. On 17 April 2010, Etihad Airways announced they'd launch passenger flights to Baghdad from Abu Dhabi from 26 April. In June 2011, EgyptAir announced the launch of flights connecting Cairo International Airport to Baghdad from 27 August 2011. The airline previously served the city in the early 1990s. Flights would be operated with Airbus A320 aircraft. On June 2011, Emirates again announced the launch of flights connecting Dubai International Airport to Baghdad from 13 November 2011. On 7 June 2012, Qatar Airways launched direct flights from Doha, four times a week. On 16 February 2013, Iraqi Airways resumed flights from Baghdad International Airport to Kuwait International Airport. This came after a 22-year hiatus. On 6 March 2013, Iraqi Airways resumed direct flights from Gatwick Airport to Baghdad International Airport. This came after a 23-year hiatus. On 25 April 2013, Iraqi Airways resumed flights to Frankfurt Airport with a Boeing 777-200LR. On 22 September 2013, Iraqi Airways announced that it would start flying to Beijing, Guangzhou, Shanghai and Bangkok. On 14 April 2014, Iraqi Airways announced that it would launch flights from Baghdad to Vienna International Airport. On 18 May 2010, plans were unveiled for an expansion of Baghdad International Airport, which will double its capacity to 15 million passengers per year. The expansion, to be funded by foreign investors, will include the construction of three new terminals and the refurbishment of the existing three terminals, which will each accommodate 2.5 million passengers annually. 1: Iraqi Airways' flights between Baghdad and Gatwick stop in Sofia. However, the airline does not have the rights to transport passengers solely between Baghdad and Sofia. On 25 December 1986, Iraqi Airways Flight 163, a Boeing 737-200, flying from Baghdad to Amman, Jordan, was hijacked and damaged by a bomb in flight. The bomb exploded in the cockpit causing the plane to crash in Saudi Arabian desert, killing 63 of 106 on board. On 29 November 1987, Korean Air Flight 858, a Boeing 707-3B5C, was destroyed by a bomb over the Andaman Sea, the bomb was left by two North Korean agents who boarded in Baghdad but got off in Abu Dhabi. The plane was flying the Baghdad-Abu Dhabi-Bangkok-Seoul flight. All 104 passengers and 11 crew died. On 22 November 2003, a European Air Transport Airbus A300B4 freighter, registered OO-DLL, operating on behalf of DHL Aviation, was hit by an SA-14 'Grail' missile shortly after take-off. The airplane lost hydraulic pressure and thus the controls. After extending the landing gear to create more drag, the crew piloted the plane using differences in engine thrust and landed the plane with minimal further damage. All 3 crew survived. Civilian planes now routinely perform corkscrew landings to minimise the risk of damage from surface weapons. On 26 January 2015, a flydubai Boeing 737-800 on a Dubai to Baghdad service, was hit by small arms fire on approach to Baghdad International Airport with 154 passengers on board. The plane landed safely. ^ Airport information for ORBI at World Aero Data. Data current as of October 2006.Source: DAFIF. ^ Airport information for SDA at Great Circle Mapper. Source: DAFIF (effective October 2006). ^ Technology transfer to the Middle East. Retrieved 4 June 2015. ^ a b Fahim, Kareem (27 January 2015). "Airlines Suspend Flights to Iraq's Baghdad Airport After Jet Is Hit by Gunfire" – via NYTimes.com. ^ Arango, Tim (20 November 2014). "Amid Mutual Suspicion, Turkish Premier Visits Iraq". The New York Times Company. The New York Times. Retrieved 22 November 2014. ^ AirForces Monthly. Stamford, Lincolnshire, England: Key Publishing Ltd. August 2014. p. 22. ^ "Etihad to start flights to Iraq". Retrieved 4 June 2015. ^ "أول ناقل وطني سعودي إلى العراق". ^ Liu, Jim (24 April 2018). "Iraqi Airways adds Kiev scheduled service from mid-April 2018". Routesonline. Retrieved 24 April 2018. ^ Liu, Jim (11 October 2017). "Iraqi Airways Germany / Russia service changes from Oct 2017". Routesonline. Retrieved 11 October 2017. ^ Liu, Jim (21 March 2019). "Iraqi Airways adds Munich service from late-March 2019". Routesonline. ^ Ltd, DVV Media International. "Dnata scoops new Egyptair Cargo handling deal in Dubai ǀ Air Cargo News". www.aircargonews.net. ^ 2017, UBM (UK) Ltd. "Turkish Airlines Cargo adds new destinations in W16". ^ "The opinion pollsters who dodged mortar fire and militias". BBC News. Retrieved 4 June 2015. ^ "Boeing Hit by Gunfire in Baghdad". Airliner World: 83. March 2015.